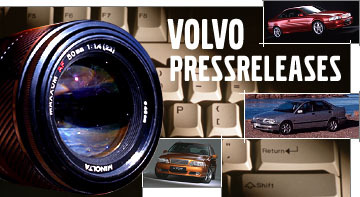 With the C30, Volvo made its debut in the segment for two-door premium cars. The sporty design, with two doors, four individual seats, and a glass tailgate, aims to give a young and dynamic group of customers "a Volvo of their own". In 2009, the C30 boosted its personality even further with a new, more confident front, a bold styling kit for those who want even more attitude - and a new razor-sharp sports chassis. The Volvo C30 displays clear elements of other classic Volvo models with a sporty pedigree, such as the Volvo 1800 ES. Anyone who recalls the acclaimed Volvo SCC (Safety Concept Car) will recognise the exclusive and convenient glass tailgate. The grille has a unique pattern with the enlarged iron mark in the centre. The air intake resembles that of the XC60. Viewed from the side, the pronounced wheel housings and the sloping roof give the C30 a fast silhouette that is further enhanced by the markedly boat-shaped side windows. This has been created through the narrowing roof and the wide shoulders. The shoulders at the rear are powerfully rounded and accentuated by both the horseshoe-shaped lighting pattern of the tail lamps and the glass tailgate. 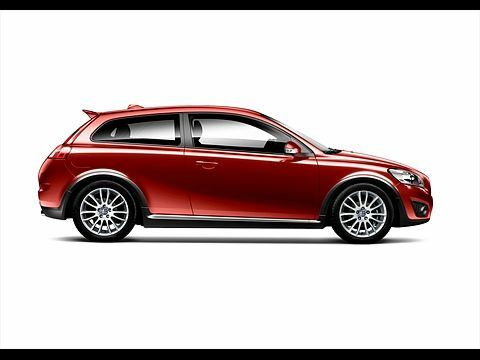 The C30 is also available in an R-Design version featuring a redesigned front and rear. The body kit is colour-coordinated with the rest of the body, giving the impression that the car has been lowered more than the actual 10 mm reduction in ride height. The C30 R-Design is also equipped with five-spoke Cratus wheels that are the hallmark of the R-Design range. The interior is available with dramatic new black upholstery as an alternative. The C30 has room for four adults thanks to the two separate seats in the rear, with generous head- and legroom. The rear seats are slightly centred to provide a feeling of space and a good forward view. It also makes communication between front and rear occupants much easier. The interior is inspired by Scandinavian product design with the emphasis on uncluttered surfaces, honest materials and functionality. Volvo's ultra-thin centre stack is available in a new Oyster Burst Déco version, inspired by the surface texture of the classic Swedish Hagström guitars that became world-famous in the hands of stars such as Elvis Presley back in the 1950s. 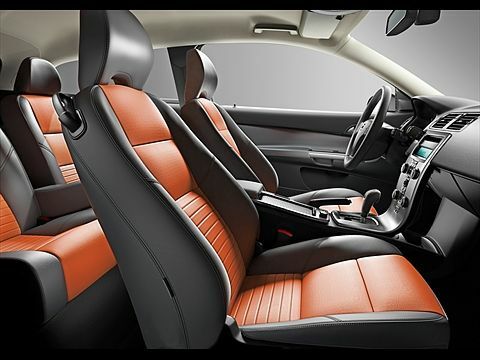 The Volvo C30 offers a range of interior options. Among other things, there is a combination known as Espresso/Blond, consisting of a dark brown upper section and a blond, fresh shade on the lower door sides. The blond tone, somewhere between grey and beige, is an expression of Volvo's strong Scandinavian design tradition. The Espresso/Blond interior permits the integration of energetic new highlight colours such as orange, green and blue in the fabrics, as well as leather upholstery in Cranberry. The Volvo C30 can be equipped with Bluetooth® technology that enables wireless communication. By connecting Volvo's Bluetooth device to the car's audio system and a Bluetooth-compatible cellular telephone, easy and practical hands-free phoning is made possible. Cars with Volvo On Call now have the option of activating the cabin heater remotely via SMS text messaging. The High Performance and Premium Sound systems have a USB port, making it easy to attach an iPod® or other MP3 player or even a digital camera to the audio system. Thanks to its small size, the Volvo C30 is very nimble to handle, even in limited space. It is built according to the same principles as the rest of the cars in the Volvo range. A very torsionally rigid body, a wide track and a relatively long wheelbase all help give it responsive and stable driving characteristics. The optional sports chassis (also available together with R-Design) has been modified in several areas. The steering is more precise owing to the installation of stiffer bushings. The steering ratio is lower, giving 10 percent faster response to steering wheel input. Spring stiffness has been increased by no less than 30 percent in order to improve the car's poise in enthusiastic driving. The dampers are also stiffer and the exclusive mono-tube technology builds up pressure much more quickly. The roll stabilizers are stiffer to reduce any leaning tendency when cornering. The new sports chassis makes the C30 a better-balanced and more agile car. Road contact is more distinct and feedback from the wheels is faster and clearer, promoting a more alert feeling while driving. This is something that also benefits safety. The engines in the Volvo C30 are transversely installed in-line units. Together with large displacement, the five-cylinder configuration provides high torque across a broad rev band, and thus also swift acceleration and excellent driveability within a wide speed range. Four-cylinder engines are also available. The Volvo C30 T5 is the top model, featuring a turbocharger and five-speed automatic transmission or a six-speed manual gearbox. It produces 230 hp and 320 Nm of torque. Other petrol engine versions are also available, as well as a 2.0-litre bio-ethanol Flexifuel variant on certain markets from late 2010. The new five-cylinder 2-litre turbodiesel introduced in the all-new Volvo S60 is now available throughout Volvo Cars' model range. The new five-cylinder D3 is in principle the same engine as the well-established 2.4-litre diesel, but its displacement has been reduced with a shorter stroke to optimise fuel consumption. The engine has been optimised for low fuel consumption and the injection system has a different type of piezoelectric fuel injector compared with the D5 engine. These injectors minimise consumption with exceptionally rapid and precise injection pulses under high pressure. This promotes extremely efficient combustion. Both the new D3 and D4 meet the Euro 5 emission standards. All the variants of the new two-litre turbodiesel can be specified with a six-speed automatic transmission or six-speed manual gearbox. The C30 is in addition available with the 1.6-litre D2 diesel engine, which also complies with the Euro 5 standards. Fuel consumption is 4.3l/100 km (EU Combined), which corresponds to CO2 emissions of 114 g/km. The engine produces 115 hp and 270 Nm of torque and now comes with a six-speed manual gearbox. The DRIVe version of the C30 has a Start/Stop function, lowering fuel consumption to 3.8 l/100km and CO2 emissions levels to 99g/km. The engine delivers 109 hp. The Start/Stop function shuts off the engine when the car is standing still and the driver releases the clutch and puts the gear lever into neutral. As soon as the driver presses the clutch again the engine restarts. The Start/Stop function reduces fuel consumption and CO2 emissions by 4-5% (in mixed driving conditions). In urban traffic, fuel consumption and CO2 emissions can be reduced by up to 8%. Volvo Cars has developed various information systems designed to help the driver while on the move. One such system is IDIS (Intelligent Driver Information System), which for instance delays incoming phone calls in complex traffic situations that require the driver's undivided attention. 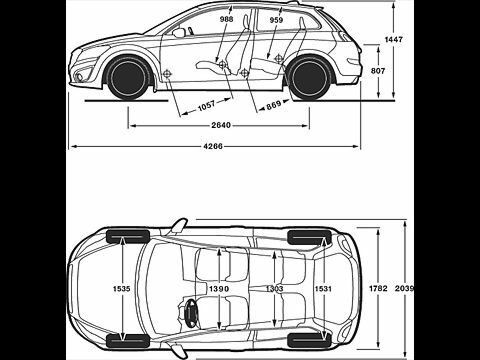 Protective safety in the Volvo C30 is structured around a network consisting of exterior and interior safety systems that interact with one another to reduce the risk of occupant injury in a collision. The body of the Volvo C30 features immense torsional rigidity and the car has a sturdy chassis, a combination that results in consistent, predictable behaviour on the road. Incoming collision forces are distributed so the passenger compartment remains as intact and undamaged as possible. The car's body is therefore built in the form of a metal cage made from different grades of steel, where all the components interact with one another to ensure controlled deformation. The interior safety systems aim to keep the passengers securely in place and also to reduce the risk of serious injury. In order to provide the most effective protection possible, Volvo Cars has developed a number of in-house systems such as WHIPS (Whiplash Protection System), SIPS (Side Impact Protection System) and IC (Inflatable Curtain). 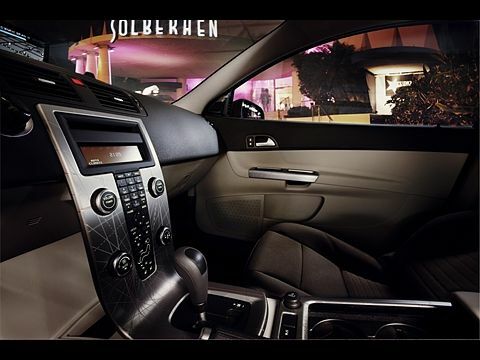 All are fitted as standard in the Volvo C30. What is more, all four seats are equipped with three-point inertia-reel seat belts, belt pre-tensioners and head restraints.